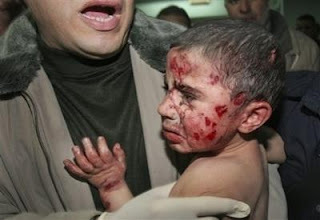 National Council of Arab Americans (NCA): Death and Darkness in Gaza, People are dying, Help us! A humanitarian crisis is underway as the Gaza Strip's only power plant began to shut down on Sunday, and the tiny coastal territory entered its third full day without shipments of vital food and fuel supplies due to Israel's punitive sanctions. The Gaza Strip's power plant has completely shut down on Sunday because it no longer has the fuel needed to keep running . One of the plant's two electricity- generating turbines had already shut down by noon. This will drastically reduce output to 25 or 30 megawatts, down from the 65 megawatts the plant produces under normal conditions. By Sunday evening the plant will shut down completely, leaving large swaths of the Gaza Strip in darkness. Omar Kittaneh, the head of the Palestine Energy Authority in Ramallah, confirmed that by tonight, the one remaining operating turbine will be powered down, and the Gaza power plant will no longer be generating any electricity at all. "We have asked the Israeli government to reverse its decision and to supply fuel to operate the power plant", Dr. Kittaneh said. "We have talked to the Israeli humanitarian coordination in their Ministry of Energy . We say this is totally Israel's responsibility, and that reducing the fuel supplies until the plant had to shut down will affect not only the electrical system but the water supply, and the entire infrastructure in Gaza – everything." After months of increasingly harsh sanctions, Israel imposed a total closure on the Strip's border crossings, even preventing the delivery of humanitarian aid. The Israeli government says the closure is punishment for an ongoing barrage of Palestinian homemade projectiles fired from the Gaza Strip. "Famine"180 fuel stations have shut down after Gaza residents to buy gas for cooking. A Palestinian economist Hasan Abu Ramadan said the current humanitarian disaster in the Gaza Strip will be deepened by the blockade on fuel and food supplies. He warned that Gaza Strip could go from a situation of deep poverty to all out famine, disease, and malnutrition. Abu Ramadan said that more than 80% of the Strip's 1.5 million residents have been surviving with the help of food aid from international organizations such as UNRWA for Palestinian refugees.International condemnation Most international actors in the region believe there already is a humanitarian crisis in Gaza, including the UN's Emergency Relief Coordinator, the Undersecretary- general for humanitarian affairs John Holmes, who said at a press conference at UNHQ in New York on Friday that "This kind of action against the people in Gaza cannot be justified, even by those rocket attacks". This, and the killings of other Palestinians during the week, plus the closures, "raise very serious questions about Israel's respect for international law and its Commitment to the peace process", Dugard said. He said it violates the strict prohibition on collective punishment contained in the Fourth Geneva Convention, and one of the basic principles of international humanitarian law: that military action must distinguish between military targets and civilian targets.